Cuban authorities are on the verge of enacting a new foreign investment law considered one of the most vital building blocks of President Raul Castro's effort to reform the country's struggling economy. The law is seen as so important that an extraordinary session of parliament has been scheduled for Saturday so the matter doesn't wait several months until the regular summer session. Few concrete details have been made public, but this week official media gave some hints of what the draft law looks like. The newspaper Juventud Rebelde said it will allow foreign participation in all sectors except health and education, and not only through joint partnerships with the socialist government. Also allowed would be an "international economic association contract, or business of completely foreign capital." Juventud Rebelde said most companies would be taxed at 15 percent of profits, half what they pay under current rules, and they will be exempt from paying for the first eight years of operation. Investors apparently will not see their personal income taxed. Duties may be higher for operations that exploit natural resources, such as nickel and fossil fuels. Foreign investment in the Communist-run country has lagged behind expectations in recent years, and the shortfall is seen as a major reason for disappointing economic growth. Analysts say that officials must show they are truly committed to easing the way for foreign firms if this latest attempt to lure overseas capital is to succeed. "It's really about (creating) a business climate in which business feels government at senior levels has an unambiguously favorable attitude toward foreign investors," said Richard Feinberg, a professor of international political economy at the University of California, San Diego. "That's the best guarantee." "If this law gives the right signals," Feinberg said, "it would be a major step forward in the economic reforms." Cuba isn't the easiest place for a foreign businessperson to make a buck. Labor taxes are high, there is no open bidding for projects, the approval process is opaque and cumbersome and the government has been reluctant to let outsiders have majority ownership. Companies often find themselves negotiating multimillion-dollar deals with government officials who earn tiny salaries, and some say payoffs are an unfortunate part of doing business in Cuba. At the same time, a crackdown on graft, including the jailing of Canadian, Chilean, Czech, English and French citizens, has sent a chill through the foreign business community. Then there's the 52-year-old U.S. embargo, which bars most American trade with the island and effectively obliges many foreign companies to choose between doing business with Cuba or the United States. There's no sign the embargo will be lifted anytime soon, but observers say Cuba can make itself more attractive to investors by doing things like making approvals more transparent, easing payroll taxes, enabling direct hiring of local employees and relaxing rules that require foreign companies to purchase a certain amount of local inputs. The rules described in Juventud Rebelde would be almost as favorable as those already in place for a special economic development zone at Mariel, a massive port project west of Havana that was formally inaugurated in January. Officials are also talking of guarantees that the property of foreign companies and individuals will not be nationalized as happened after the 1959 Cuban Revolution, except in cases of national interest and only with due compensation. In a recent report for the online publication Cuba Standard, which closely follows Cuban business news, former Cuban Central Bank economist Pavel Vidal noted that foreign investment has remained flat since Castro's economic reforms began, about 20 percent below forecast on average. GDP grew just 2.7 percent last year, low for a developing nation and again short of expectations. Meanwhile, Cuba is heavily dependent on the billions of dollars in oil it gets from ally Venezuela. The socialist-run South American nation is experiencing its own economic woes these days, rocked for weeks by violent protests amid calls by some in the opposition for President Nicolas Maduro to resign. Vidal said the new law could help stimulate investment by limiting government officials' discretion in decision-making on approvals, ending a longstanding tendency to green-light only large-scale investment and allowing investment in Cuba's emerging privately owned businesses and independent cooperatives. "The new foreign investment law is the last opportunity for the reform to come close to the growth goals planned through 2016," wrote Vidal, who is currently a professor at Javeriana University in Cali, Colombia. "At the same time, it will help diversify the island's international relations, as well as reduce vulnerability due to its links with Venezuela." que ahora se unificaron, estuvo disponible desde julio de 1997.
queden como simples receptores, sino también como principales emisores". computadoras, tablets, y teléfonos móviles. al usuario atendiendo a la jerarquización del material a subir". francés, alemán, italiano, y portugués. joven equipo de trabajo se presentó ante los asiduos lectores. muchas cosas si creyéramos que son muchas menos las imposibles". sabiduría constantes, deberá acomodarse a frecuentes cambios". tono con el llamado de Raúl Castro. un cambio de maneras en la prensa nacional. (quinto), El Artemiseño (quinto), Granma Internacional (sexto). Díaz-Canel en una reciente entrevista. reservados para las habituales loas al actual estado de cosas en la isla. colocar directivos no vinculados directamente con el sector. timidez empiezan a colocar sus críticas. necesidad de este cambio de imagen, y se muestran alegres de poder comentar. al menos en cuestiones no explícitamente políticas. el nuevo espacio, uno de los pocos que no permitía la participación pública. significa visitar todas las noticias. sobre todo aquellos peor argumentados. archiconocidos procedimientos de la censura en isla. such as Trabajadores and Juventud Rebelde. International) became available as a digital publication in July of 1997.
main sources of such content." and smartphone versions of the site have also been released. decision-makers to act, not only expediently, but also intelligently. French, German, Italian and Portuguese. things if we believed that fewer things were impossible." happiness and wisdom must adjust to frequent changes." keeping with the appeals made by President Raul Castro. same team of designers, commented Diaz-Canel in a recent interview. possibility and timidly begin to post their criticisms. the opportunity to share their comments. time it took to open the different news pages. mechanism we know so well. AGENCIAS | La Habana | 31 Mar 2014 - 6:44 pm. es aplicada en la práctica". empleados cubanos en lugar de hacerlo a través de una entidad estatal. crecimiento anual del 7 por ciento. debe crecer solo un 2,2 por ciento este año. renovación de edificios y negocios de bienes raíces. ha cambiado", dijo un diplomático europeo que pidió no ser identificado. "Al final, toda la ley continúa siendo discrecional". que el Partido Comunista aprobó las reformas económicas en 2011.
quién tendría la participación de control. Ltd, acusados de cometer fraudes no especificados. suma ridículamente baja por su participación. empresario a la agencia española de noticias EFE. Group y la española Meliá Hotels Internacional. "Todavía es un lugar para hacer negocios. Pregunte a los brasileños. gigante brasileño de la ingeniería Odebrecht S.A.
opinión, se beneficiarían de un eventual fin del embargo de Estados Unidos. think I can make some general comments. aspects of a society based on cooperation rather than competition. self-interest of the members of these collectives. interests of the working class as a whole? within the society and ultimately the destruction of Yugoslavia itself. in which the workplaces can serve the needs of the local communities. country) was attacked as exploitation by a Stalinist state. institutional rectors of the nation? kind of state – a new state. city and from there upward to the new national state – a state from below. it is a state which produces the people required for a socialist economy. oriented toward building socialism which can listen and learn. characteristics in other countries of the South. and end up importing substantial amounts of their foodstuffs. and leaving things to the market to solve the problem. need to recognize their responsibility to society. some form of hostile consequences. nor as a kind of consolation for those whose right to dissent is curtailed. nonsensical text and never to genuine literature or journalism. literary piece if one is forced to respect the limits imposed by others. effective influence on the public sphere. as insubstantial as hot air. by the other, part of a discourse that is only apparently coherent. that prevail in our society. según dijeron, evita su eventual amputación. 24 de marzo en el Loews Hollywood Hotel de Los Angeles. afirmó,está registrado en una veintena de países. tratar las ulceras del pie diabético. en el mundo, 28 de ellos en Cuba. extremidades en algún momento de la vida. para comercializar el medicamento en el país. en la producción de alimentos, bienes y servicios exportables. aprobada la pasada semana por la Asamblea Nacional del Poder Popular. 'Trabajadores'. The harvest runs from the end of March to early April. (UEB) de transporte del municipio. estos suelen verse espacios cercados con plantaciones de yuca o plátano. Alguna carpintería rústica o hasta cochiqueras. espacio común. Nadie que proteste. Refutar es buscarse problemas. comenzó la desintegración de la familia. además estaba trabajando en Venezuela. gobierno cubano y que conocían lo sucedido con los "niños de Rusia"
enviados por el gobierno a trabajar al exterior. embarcaciones y tienen la sensatez de no llevar menores tan suicida acción. genocidas de los que han dirigido por más de 50 años la devastada Isla. de Resistencia "Orlando Zapata Tamayo". día no le han permitido salir de su vivienda. DDC | Santiago de Cuba | 31 Mar 2014 - 5:52 pm. productos almacenados (noviembre del 2012) porque es 'incorrecta'. las infecciones de transmisión sexual (ITS), y el VIH/sida en particular". con la llegada de envíos contratados en el exterior. de vencimiento de los preservativos almacenados en la provincia. Según Suárez Ramírez, se borra una "fecha incorrecta de vencimiento"
poner una nueva (diciembre del 2014). dispositivos médicos de Cuba (Cecmed)". en el primer trimestre de 2014, pero "no tuvo la agilidad requerida". 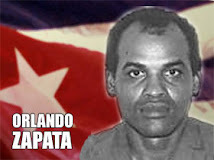 tyranny that has dominated Cuba since 1959.
bring freedom to his homeland. interred, before being placed to rest in Cuba some day. indefatiguable life, which he committed fully to Cuba. interview, taking notes of the transcription of the video. did they get that name Huber from?" book of its era on the subject. be strong inside," said my father. And that's how me raised me. function that goes beyond saving one's skin. factor. If, in those beatings they give … once they almost split me. They made deep scars on my neck area. Cubanet: But you also trained values as a part of the Cuban magisterium. HM: "I spent years training teachers in the normal school in Manzanillo. "I told them: The Republic is an entity that must be built day by day. which corresponds to him. Help form a conscience. feel hatred towards the Castros, declared enemies of yours since then? overcome all they've done to me. this is beyond my rights, what I deserve." unsettled account (with the government) with the Cuban people. 21 October, which was when I resigned, to impress me with Camilo. you." Camilo didn't put much stock in that. Cubanet: Have you been afraid? difficult situations, I haven't backed down. Revolution is saved and the republic is saved, then blessed be my death." Cubanet: You know intimately the how attached the Castros are to power. Do you think Raul has the will to change? deceive the rest and leave with what's theirs. for dominion and power traps all mankind. "Raul is very careful to make sure of this and that, he's organized. and have known through his pronouncements." Cubans, what would you say? said, "with everyone and for the good of everyone". whorehouse, a colony, a farm — something — but not a republic. with the values that inspired them is permanent. Service to collectivity. maximum effort for that achievement." Cubanet: Does Huber Matos still have things to do? there. I can't afford to fool myself, 94 years isn't a very short time. the dawn to come out. businesses that arose in the midst of the privations of the period. increased flexibility with regards to customs, to encourage investment,"
Saturday March 17, 2014, page 3), elements not covered in the Law. capitalist entrepreneur, in case anyone had any doubts. terms for the investment and the protection of the National Patrimony,"
empire that seems to be the borders of entire world. year, and one hundred gold coins. "So be it!" commanded the emperor. stained painter's smock. The sovereign asked, "Is your work ready?" workshop, ten servants, five years and two hundred gold coins." "So be it!" commanded the emperor. before the sovereign. "Let's see," he said, "show me, finally, your work." servants, five more years, and five hundred gold coins." spring overcame him and he decided, again, that it would be thus. the most beautiful nightingale in the world. get on and off the planes taking them to their final destinations. used to promote one of the most important "achievements" of the regime. propaganda posters illustrating "the path towards communism." and their patients. Moreover, they would undoubtedly last much longer. vote of the artists don't decide, but their personalities are malleable. of the nation; a total fraud. The creator's guild does not answer to its members but to the State. It's just a detail that makes an organization useless and falacious. the carrot of Cuban writers. International to declare Angel a prisoner of conscience. desde La Habana hasta las costas de Estados Unidos. se casó sin saberlo con un espía cubano en Miami. incapaces de volar los aviones en ningún lugar. parientes suyos, a Estados Unidos en noviembre del 2002. Cessnas del grupo en aguas internacionales, matando a cuatro pilotos. Hueso y Martínez hizo la mayor oferta, $7,000. dijo Martínez después de la subasta. conmemorar la independencia de Cuba. deteriora bajo lonas en una esquina apartada del campus de la FIU. seguro, todos los cuales se encuentran en Cuba. tuvo una oportunidad de obtener registros de aviones cubanos. "Lo volaría de regreso", dijo Soldini la semana pasada. revolución, se mantiene en buenos términos con los dirigentes de la isla. ejército rebelde, junto con Raúl Castro y sus tropas. permaneció en Cuba, pero no se sintió bien allí como estadounidense. visitar a Cuba unas dos veces al año. hacia Cayo Hueso por Adermis Wilson González. cumple una sentencia a 20 años por piratería aérea. Al igual que con el bimotor, ambos aviones fueron subastados. Matthew Overtor adquirió el Antonov AN-24 por $6,500. es su avión", dijo Van Heusden. por mantener los aviones en Cayo Hueso, y ambos decidieron venderlos. usa para simulacros de emergencias. El compró el avión a Van Heusden y contactó a los Castro. gobernante cubano no los quiso. Soldini. "No pude hacer nada". Soldini regresó a Cayo Hueso, desarmó el avión y lo puso en un camión. Soldini espera que un día esté en un museo, porque nunca volará de nuevo. verdadera vocación: escribir artículos periodísticos sobre economía. en cuanto a resultados profesionales, resulta muy gratificante. P: ¿Cuándo entraste en la prensa independiente? en mi caso se produjo un proceso de aprendizaje de manera ascendente. P: ¿Cómo valoras el servicio público que presta la prensa independiente? P: ¿Cuáles son los temas de tu preferencia? que realmente ocurre en la economía cubana. Juan González Febles, el famoso Johnny. Verdad, David Piloto Barceló, demanda se le haga un chequeo médico. mayor Vargas, segundo jefe de la unidad, le niegan la asistencia médica. Piloto Barceló tuvo tuberculosis y quedó con secuelas. Estado de lo que pudiera sucederle. familia y actualmente no puede visitarlo por estar enferma. políticos que cumplen injustas condenas en Cuba. la primavera negra de 2003. El número de su causa es 2/2011 y el de su expediente es 14304593. Mamá, qué cosa es un bisté? Is Cuba ready to open up to foreign investment? Inversor ¿usted apostaría a Cuba?